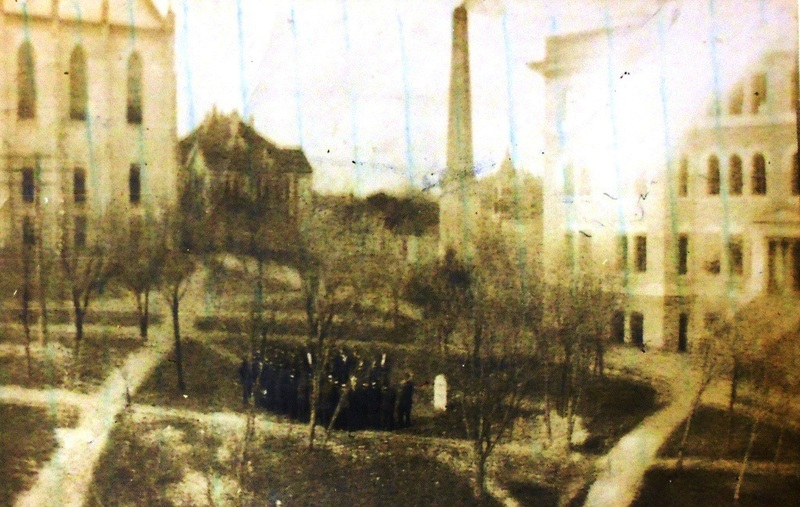 Above: Students hold a funeral service for the beloved “George Town.” Buildings from left: north wing of Old Main, Chemistry Lab Building (burned in the 1920s, where the biology ponds are today), smoke stack of the first power house, Littlefield Home in the distance, and the newly finished Engineering Building (now the Gebauer Building). Click on the image for a larger view. At first glance, the image is a somber scene. It’s grainy and poorly focused. A lack of shadows suggests it was a gloomy, overcast day, and the mostly barren trees imply the photograph was taken in winter or early spring. 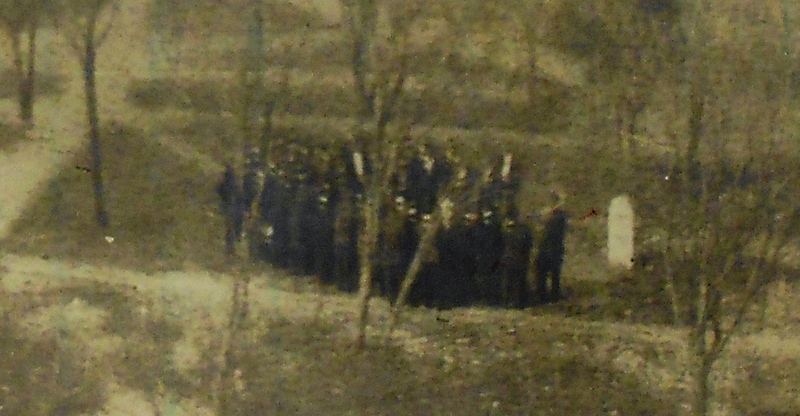 At the center, a group of about twenty-five men, dressed in dark suits and hats, have solemnly gathered in front of what looks like a gravestone. But don’t be fooled, as this was no ordinary memorial service. The hurried photographer captured one of those rare student shenanigans: a funeral for an outhouse. In April, 1900, when severe storms and flood waters destroyed the original Austin Dam (since replaced by the Tom Miller Dam), the city’s water supply and, in turn, the sewer system, were unreliable for several years. Of course, this affected everyone on campus, especially the occupants of B. Hall, the University’s first residence hall for men. As a proactive measure, temporary restroom facilities were built just west of the dorm. By 1904, University officials thought the outhouse was no longer needed, and over the week-long break for Christmas holidays, a few students who’d remained in Austin were recruited to raze the structure with the help of a telephone pole battering ram. When B. Hall residents returned after the New Year, they discovered their institution gone, but not forgotten. Once assembled in front of the marker, “Reverend Dutch” uttered a short prayer, led another song, then turned the program over to Toombs, who eloquently expounded upon the virtues of the late Mr. Town and his unselfish devotion to mankind. 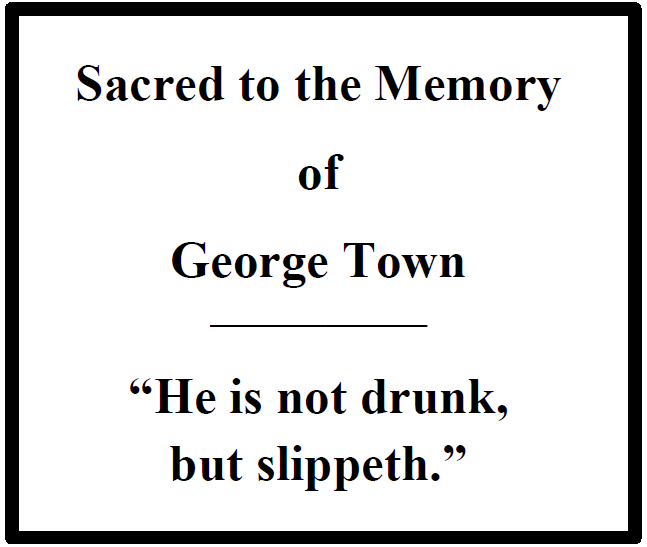 Toombs described at length how “George” had been “a sheltering friend to many in need, at times of their most poignant distress.” Apparently the eulogy brought tears to the eyes of many of the listeners. Early spring flowers, swiped from groundskeeper Harry Beck’s campus gardens, were laid on the ground in front of the marker. The ceremony concluded, Toombs remembered, “We left the hallowed spot with the consciousness that another worthy deed had been done where so many had been done before.” The group made their way to Weilbacher’s Confectionary and Soda Fountain downtown to drink a toast to the dearly departed. This entry was posted in Uncategorized and tagged Alf Toombs, Georgetown, Jim Nicar, Southwestern, Victor Lieb by jimnicar. Bookmark the permalink.